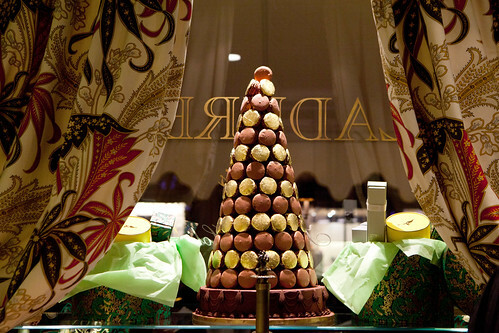 On Thursday night, I was invited to Ladurée‘s New York City flagship location for their first holiday party. Their windows were decked out in ornate holiday attire of gold and rich forest green. Attendees were chic Upper East Siders and fashionable people (I saw Frederic Fekkai, the famous hair stylist to the celebrities and Reed Krakoff, the handbag and clothing designer, and Mr. Krakoff’s wife) while I was there. While enjoying the festive atmosphere, I obviously enjoyed Ladurée’s famous macarons. From the Incroyables collection, they served the an intensely hazelnut macaron and lime-basil marshmallow macaron and from the seasonal collection their sublime Santo Domingo pure chocolate macaron (had wonderful fruitiness), black currant-violet, chocolate milk and Christmas flavor (it’s chocolate with red berries ganache). I’ve noticed that their macarons have an improvement in texture ever since they started selling their wares here. 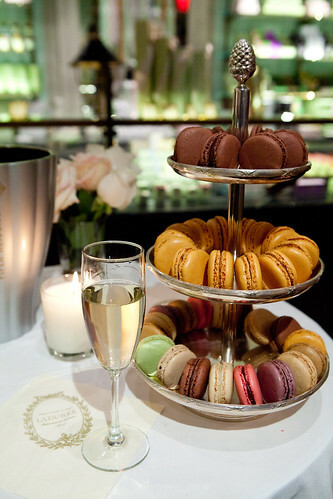 These macarons paired wonderfully with the glasses of brut Piper Heidsieck Champagne. 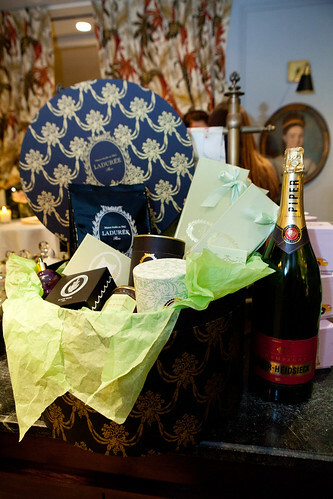 I did view and smelled the wonderful limited edition candles, whose fragrances were inspired by Paris (vibrantly fresh and floral) and New York (floral but musky and sexier) and saw their large custom hatbox for gifts. 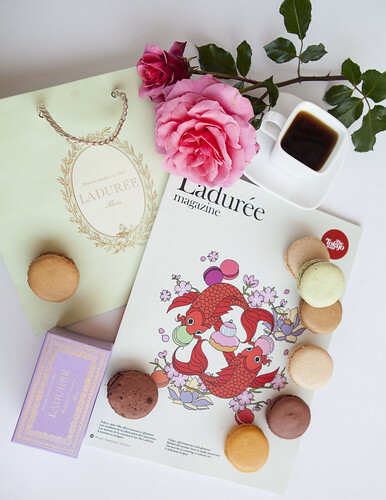 I had another round of these delicious macarons this morning before heading out to work, while flipping through the beautiful Ladurée magazine that was inspired by Tokyo.